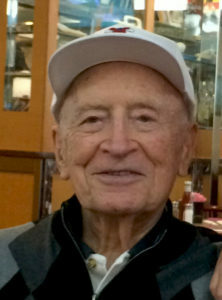 It is with a heavy heart that we must inform you of the passing of our dear friend and founder, Jack Cappel on July 15, 2018 at the age of 100. Jack was born in Montreal, Canada to Bessie (nee Lieberman) and Benjamin Cappel. He served in the Canadian Army from 1939 to 1946. He emigrated from Canada to New York in 1949, and began his career in the confectionery industry in 1949 with Edward Sharp & Sons where he eventually became Vice President. He also served as Vice President at Adolph Goldmark & Sons, and went on to found Dorval Trading Co., Ltd. in 1966 with his wife, Florence, where he acted as Chairman until the time of his passing. His strong leadership and lively persona helped Dorval become a significant presence in the confectionery and specialty industries for over 50 years. His many accolades include selection as National Candy Wholesalers Association Diplomat, and induction into the National Confectioner’s Association Candy Hall of Fame and Specialty Food Association’s Hall of Fame. He was predeceased by his beloved wife, Florence, his three brothers, Harry, Morris, and Julius, and their wives. He is survived by 3 children, Beverly, Roberta and her husband Kal Rothman, and Jonathan, and 3 grandchildren, Sam, Ben and Olivia. He will be deeply missed by all and Dorval will continue to honor his memory and wonderful legacy. Anyone wishing to make a charitable contribution in Jack’s name may do so to the United States Holocaust Memorial Museum (https://give.ushmm.org/donate) or charity of choice.